Rimback et al. compared systemic lidocaine (3 mg/min) versus normal saline placebo in 30 patients undergoing elective cholecystectomy in the early 1990s. They found reduced need for opioids, earlier return of bowel function, and shorter hospital stays. This group proposed a mechanism of less peritoneal irritation thus reducing inhibitory gastrointestinal reflexes.14 Several randomized, placebo-controlled clinical trials have demonstrated that IV lidocaine administration similarly reduces the duration of postoperative ileus and need for narcotic pain control, thus accelerating hospital discharge.12,14,15,17 In this early study, Rimbäck et al. implied that lidocaine infusions might reduce inflammation by blunting the sympathetic response and the associated inflammatory cascade. At Medstar Georgetown University Hospital, we have eagerly adopted IV lidocaine infusions as part of a balanced anesthetic plan. 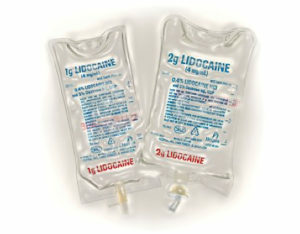 Several surgeons regularly incorporate IV lidocaine infusions into their perioperative treatment protocols. It is used as a fundamental component of our early recovery protocol in combination with acetaminophen, gabapentin, and celecoxib. This protocol is incorporated into most patients’ care undergoing colorectal surgery19 or, cholecystectomy; however, it has been used successfully in select patients not undergoing abdominal surgery. Patients are evaluated on an individual basis for candidacy of each medication. A thorough history and physical exam are performed to rule out contraindications to lidocaine (Table 1). After the patients are brought to the recovery room, our acute pain service takes over the management of the lidocaine infusion. This is an important step in maintaining safety during the infusion period to have early recognition of local anesthetic toxicity. Our staff will monitor patients at least every four hours for lightheadedness or dizziness, visual and auditory disturbances, or metallic taste and are available at all times for any concerns. Unfortunately, our clinical laboratory processes serum lidocaine as a send-out laboratory value, and, therefore, it can take up to three days to obtain a result, which limits its use in clinical practice. Therefore, if our staff recognizes or has suspicion of early signs of toxicity, the infusion is discontinued and the patient is moved to an intermediate care unit for continuous telemetry. Our protocol utilizes the Checklist for Local Anesthetic Systemic Toxicity (LAST) published by the American Society of Regional Anesthesia and Pain Medicine.23 As an additional precaution, the pharmacy will stock 20% IV fat emulsion in the automated medication dispensing system of floors where patients are receiving the infusion for quick access in case of emergency. Because lidocaine levels would not be processed in a clinically useful timeframe, it is important for us to recognize dangerous clinical signs and initiate treatment early. These signs include hypotension, seizure, loss of consciousness, and very late signs can include respiratory arrest and cardiac arrhythmia or arrest.24 If these signs are witnessed or suspected, the acute pain service attending physician is immediately notified and will determine the need for lipid emulsion. To date, we have not had any severe complications using our lidocaine infusion protocol since its implementation in the fall of 2017. Trials published using infusion rates for pain control document very few minor symptoms, which are self-limiting. Patients have noted symptoms including light-headedness, dizziness, tinnitus, or metallic taste in their mouth that resolve soon after discontinuation of the infusion. At this time, we recommend patients be monitored on the floor with continuous pulse oximetry without the need for routine telemetry. The lidocaine infusion is continued for 24 to 48 hours from initiation, as this is in line with the optimal clinical effect reported in most published trials we have investigated.11-15,17,18,25 Our acute pain service will continue to follow up for an additional day to provide an extra layer of patient safety and continue to assist with pain management as needed. Dr. Earls is an R2 (PGY-2) anesthesiology resident at Medstar Georgetown University Hospital. Dr. Bellil is Director of Obstetric Anesthesia, former Director of Acute Pain Service and Assistant Professor in the Department of Anesthesiology at Medstar Georgetown University Hospital. Neither of the authors have any disclosures relevant to this article. Special acknowledgment to Dr. David Dickerson, the Director of the Acute Pain Service and Assistant Professor in the Department of Anesthesia & Critical Care at the University of Chicago for serving as guest editor. Bartlett EE, Hutserani O. Xylocaine for the relief of postoperative pain. Anesth Analg 1961;40:296–304. Tanelian DL, MacIver MB. Analgesic concentrations of lidocaine suppress tonic A-delta and C fiber discharges produced by acute injury. Anesthesiology 1991;74:934-936. Woolf CJ, Wiesenfeld-Hallin Z. The systemic administration of local anaesthetics produces a selective depression of C-afferent fibre evoked activity in the spinal cord. Pain 1985;23:361–374. Basbaum AI. Distribution of glycine receptor immunoreactivity in the spinal cord of the rat: cytochemical evidence for a differential glycinergic control of lamina I and V nociceptive neurons. J Comp Neurol 1988;278:330–336. Abram SE, Yaksh TL. Systemic lidocaine blocks nerve injury-induced hyperalgesia and nociceptor-driven spinal sensitization in the rat. Anesthesiology 1994;80:383–391. Chamaraux-Tran TN, Piegeler T. The amide local anesthetic lidocaine in cancer surgery—potential antimetastatic effects and preservation of immune cell function? A Narrative Review. Front Med (Lausanne). 2017;4:235. Amir R, Argoff CE, Bennett GJ, et al. The role of sodium channels in chronic inflammatory and neuropathic pain. J Pain 2006;7(5 Suppl 3):S1–29. Muth-Selbach U, Hermanns H, Stegmann JU, et al. Antinociceptive effects of systemic lidocaine: involvement of the spinal glycinergic system. Eur J Pharmacol 2009;613:68–73. Ahmadi S, Muth-Selbach U, Lauterbach A, et al. Facilitation of spinal NMDA receptor currents by spillover of synaptically released glycine. Science 2003;300: 2094–2097. Daykin H. The efficacy and safety of intravenous lidocaine for analgesia in the older adult: a literature review. Br J Pain 2017;11:23–31. Terkawi AS, Tsang S, Kazemi A, et al. A clinical comparison of intravenous and epidural local anesthetic for major abdominal surgery. Reg Anesth Pain Med 2016;41:28–36. Staikou C, Avramidou A, Ayiomamitis GD, et al. Effects of intravenous versus epidural lidocaine infusion on pain intensity and bowel function after major large bowel surgery: a double-blind randomized controlled trial. J Gastrointest Surg 2014;18:2155–2162. Wongyingsinn M, Baldini G, Charlebois P, et al. Intravenous lidocaine versus thoracic epidural analgesia: a randomized controlled trial in patients undergoing laparoscopic colorectal surgery using an enhanced recovery program. Reg Anesth Pain Med 2011;36:241–248. Rimback G, Cassuto J, Tollesson PO. Treatment of postoperative paralytic ileus by intravenous lidocaine infusion. Anesth Analg 1990;70:414–419. Herroeder S, Pecher S, Schonherr ME, et al. Systemic lidocaine shortens length of hospital stay after colorectal surgery: a double-blinded, randomized, placebo-controlled trial. Ann Surg 2007;246:192–200. Kranke P, Jokinen J, Pace NL, et al. Continuous intravenous perioperative lidocaine infusion for postoperative pain and recovery. Cochrane Database Syst Rev2015:CD009642. Groudine SB, Fisher HA, Kaufman RP, Jr., et al. Intravenous lidocaine speeds the return of bowel function, decreases postoperative pain, and shortens hospital stay in patients undergoing radical retropubic prostatectomy. Anesth Analg 1998;86:235–239. Rinder C, Fitch J. Amplification of the inflammatory response: adhesion molecules associated with platelet/white cell responses. J Cardiovasc Pharmacol 1996;27 Suppl 1:S6–12. Kaba A, Laurent SR, Detroz BJ, et al. Intravenous lidocaine infusion facilitates acute rehabilitation after laparoscopic colectomy. Anesthesiology 2007;106:11–18; discussion 15–16. Wong BY, Hurwitz A. Simple method for maintaining serum lidocaine levels in the therapeutic range. Arch Intern Med 1985;145:1588–1591. Thomson AH, Elliott HL, Kelman AW, et al. The pharmacokinetics and pharmacodynamics of lignocaine and MEGX in healthy subjects. J Pharmacokinet Biopharm 1987;15:101–115. Huang YS, Lee SD, Deng JF, et al. Measuring lidocaine metabolite—monoethylglycinexylidide as a quantitative index of hepatic function in adults with chronic hepatitis and cirrhosis. J Hepatol 1993;19:140–147. Rubin DS, Matsumoto MM, Weinberg G, et al. Local anesthetic systemic toxicity in total joint arthroplasty: incidence and risk factors in the United States from the National Inpatient Sample 1998-2013. Reg Anesth Pain Med 2018;43:131–137. Di Gregorio G, Neal JM, Rosenquist RW, et al. Clinical presentation of local anesthetic systemic toxicity: a review of published cases, 1979 to 2009. Reg Anesth Pain Med 2010;35:181–187. Dunn LK, Durieux ME. Perioperative use of intravenous lidocaine. Anesthesiology 2017; 126: 729–737. Eipe N, Gupta S, Penning J. Intravenous lidocaine for acute pain: an evidence-based clinical update. BJA Education 2016; 16: 292–298.